A new Sentinel for “Star-vader” Decks appears, that also comes with a draw ability. AUTO: [Choose 1 card from your hand, discard it] When this Unit is placed on (GC) from the hand, you can pay the cost. If you pay it, choose 1 of your “Star-vader” Units, during that battle, it cannot be hit. If you oppponent has 3 or more Locked cards, you can draw 1 card. For Today’s Card, we’re introducing a card from the 6th Clan Booster “Rondeau of Chaos & Salvation” (on sale October 20th, 2017), specifically the 【Star-vader】, “Iron Wall Star-vader, Thorium”. “Iron Wall Star-vader, Thorium” is a 【Star-vader】 exclusive 【Sentinel】, in addition to the standard Perfect Guard ability against enemy attacks, if you have 3 or more Locked cards, you can draw 1 card. Since it has no Generation Break nor “Same name in the Drop Zone” requirements, as long as there’s 3 or more Locked cards, you can draw 1 card. Also, if you use “Star-vader, Chaos Breaker Crisis”, you’ll be able to increase the number of Locked cards, ensuring you can activate this ability. 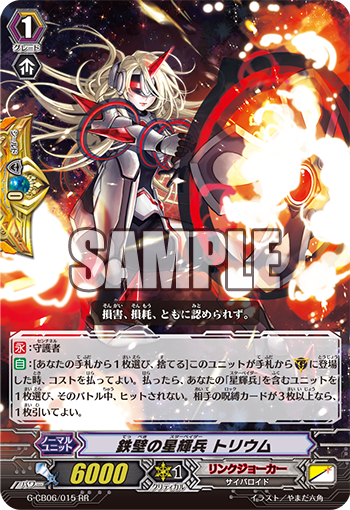 This is a 【Sentinel】 you’ll definitely want to use in your 【Star-vader】 Deck. We’ll be introducing more cards from “Rondeau of Chaos & Salvation” in future “Today’s Cards”! Please look forward to it!